Do you know what you believe? In our upcoming series, we are going to study the foundations of the Christian faith. The idea in this series is to help you solidify your beliefs. A lot of people may able to state that they believe but they really don’t know why they believe or why it’s important. We will be teaching theology at the Ridge. 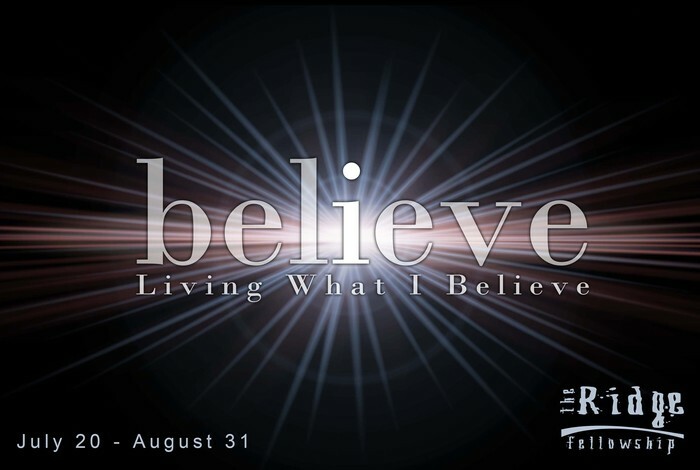 During this series we are going to go deeper than we have ever gone on some theological topics. For example, when we look at “Living with God as Father” we are going to take a theological moment and we are going to study the word “Abba”. This is a word that Jesus used to describe the relationship with God as Father. When we look at “Living with Jesus as Savior” we are going to talk about “Who is Jesus? What does his life, death and resurrection mean? What does “Messiah” and savior really mean?” And you may have heard the word Messiah or savior used over and over. We are going to take time to drill down on what that means. When we look at the Living with the Holy Spirit, we are going to talk about “Pnuma” and when we talk about God’s people, we are going to look at the word “Ecclesia” which is a teaching around the church. In discussing eternity, we are going to talk about the Biblical understanding of “Zoe” life or eternal life. So these theological moments each week during the service are going to be followed up by some next steps. We are also going to discover the life-changing difference it makes when you understand the Trinity—Father, Son and Holy Spirit. The life-changing difference it makes when you understand that you were created for a spiritual family and to be with God’s people. We are also going to talk about the life-changing difference it makes to live with eternity in mind and have the security of eternal life. In each of these upcoming messages, we hope to instruct you, theologically. We also hope to inspire you. But more importantly, we hope to give you some practical ways to better live out your faith. Then we hope that you won’t just let this series stop when the service ends on a Sunday morning. We want to challenge you to let this series breath down into your life during the week and as you live life daily. Now if you are a Christ follower, this series is going to challenge you to go deeper than ever before in your faith. We are going to try to grow your theological understanding and also give you practical ways to live out your faith in a way that makes a difference in your life, your family and in our community. But if you are not yet a Christ follower, then this series is going to show you full-frontal Christianity. You will discover firsthand what it is that Christ followers believe. No punches pulled. During the series, you will have the opportunity to decide for yourself, if you want to follow Christ and His teachings because you will know what it is all about. What you believe is important. What you believe will determine your life, your perspective, your behavior and relationships, even your eternity. I hope you will join us for Living what I Believe. This entry was posted in Living What I Believe. Bookmark the permalink.